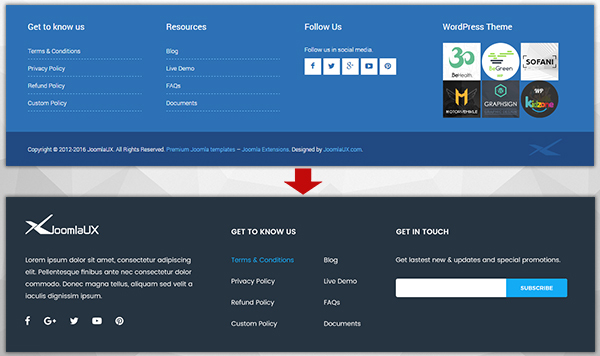 Firstly, the JoomlaUX site is absolutely secure with https:// protocol, instead of http://. It means your private information now can be kept in safe. We upgraded it with SSL Certificate with hope to bring safety and security for your personal information when logging in our website. Not only security matter but also user interface was improved. If our sometime website showed pretty much information and sometimes you found it confused to find out needed product or information, the new one was created to deal with it. Let’s talk about color first. 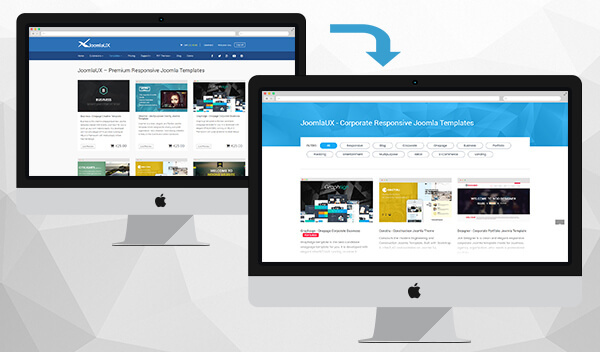 JoomlaUX site was designed with bright colors that are light blue and white and more space to bring better vision to users. 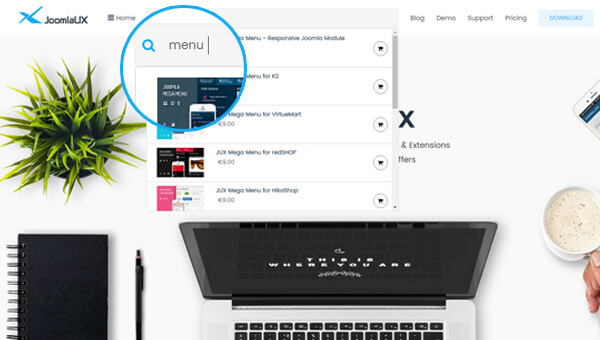 The sticky menu will definitely help you keep tracking on what you are looking for. In addition, all product items are now integrated in Browse and arranged by Categories. Now searching becomes easier than ever and interaction between you and us is considerably improved. In the new interface, the homepage is where you will find the most difference. Searching box is one of the advanced features that will impress you. Now you can easily figure out templates or products you are looking for by entering Keywords in searching box and order it immediately if it is the right one for you. Another feature added on the site is Newsletter Subscription. By this way, you won’t miss any news, updates or special promotions. You now can subscribe for newsletter right on the site in Footer section. Take a look and don’t forget to subscribe! By the way, you still find out our products and blog posts with updated news or so on the homepage but what’s new? If you all saw that our website was a little bit wordy, now this is done with only important and basic product-related information is showed. That will keep you out of confusion and your eye vision is more spacey to find out other information. That is cool, isn’t that? Product list page is also get changed in design. Now all templates and extensions are sorted by Categories and displayed in grid layout. Now you can use filter function to quickly pick up templates or extensions you need. It is extremely time-saving! Is there only homepage improved? Of course not. Still being sticky to purpose of improving user experience, we also re-designed item detail page. All product-related information now is displayed clearly and outstanding so that you can be easy to catch an item in need. Although the interface is simply but it provides enough necessary information for you before making a purchasing decision with some outstanding buttons: Demo, Documentation, Price, Version, etc. Let's take mega menu as an example! 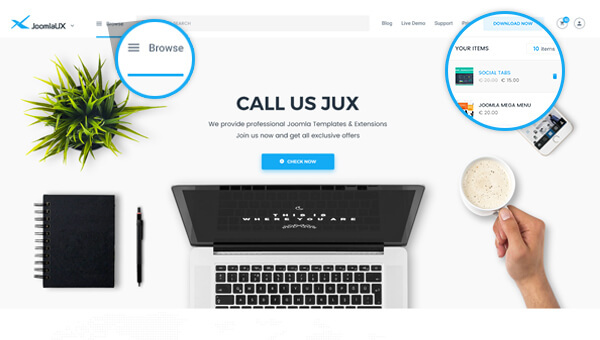 Generally, with clean and clear design, we hope to improve user interface and bring about better experience when you are served on our website. With this new interface, we hope you all can find it easy to use, to figure out information you need. 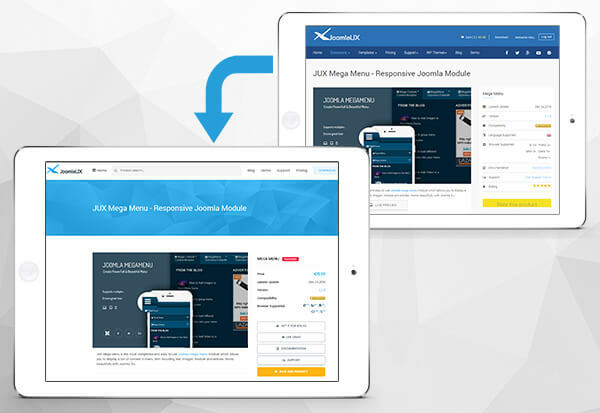 Take a click on joomlaux.com and enjoy it NOW!